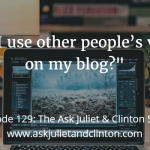 In episode 41, Juliet and Clinton discuss the pros and cons of using a personal name vs a business name for a therapy practice, how to distinguish between personal requests and business requests on Facebook, and how a copywriter can write website copy while maintaining the client’s voice. “Hi Guys! I’m loving your podcast as usual. First of all, I have to say I’m a huge fan of your podcast. You both give out such valuable insights on marketing for healers and helpers. 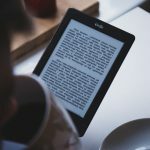 I’m a website designer and developer for psychotherapists and a lot of my clients are concerned that if they hire a copywriter to write their website copy, that the copywriter will erase their voice. So, to set the record straight, will a copywriter erase a therapist’s voice in their website copy? And if not, how is this achieved? 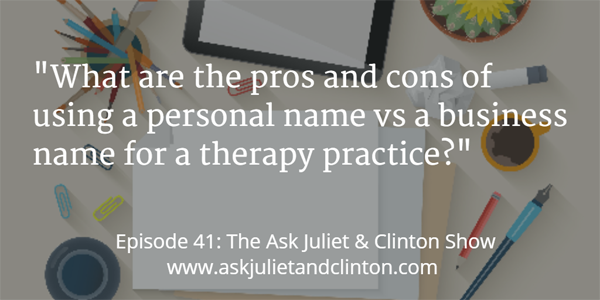 How can a copywriter both write the website copy and maintain the therapist’s voice at the same time? Hope that makes sense. I get this question ALL THE TIME from my clients. They say, “I would hire a copywriter but I think it’s better if I write it so that it sounds like me” or whatever. And I’m like, “Noooooo! Hire Juliet!” Haha. So if you do answer this question here or elsewhere, I will be forwarding it to clients regularly. 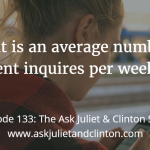 Episode 040: How do you measure Return On Investment (ROI) with things like Yellow Pages online? 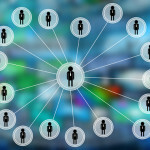 Episode 055: How do I use LinkedIn to attract clients?